The first thing a rightly done Simran does is that it takes you inside. Your awareness point is shifted inside. Simran starts you on the journey homewards, towards merging of Jyote with Jyote (light with light). What happens first is that your awareness is shifted from the world of maya to inside in the consciousness. Know that awareness is not lost only shifted to deeper levels of finer consciousness. .Guru Sahibji advices us to keep the awareness inside connected with Naam while we are operating in the physical world. From this point of attention our conscious awareness starts to function with Naam connection. At this point Simran is further done .The intention gets forceful and hold of maya reduced. We do can go further and further hearing Shabad inside, even be in Samadhi. We have to understand the significance of this shift in point of awareness which also bestows us with creative powers to live a life that befits our stature as Jyote Swaroope. Our intention will rid us of the five passions. The hold of maya on our mind will reduce. We can heal our physical body ailments. 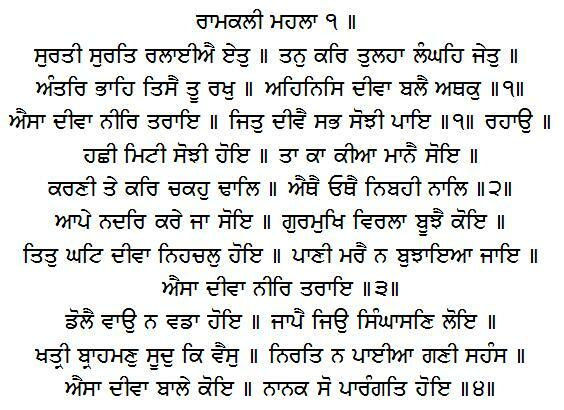 We can live in true abundance , prosperity, health and happiness based on Gurbani’s principles. 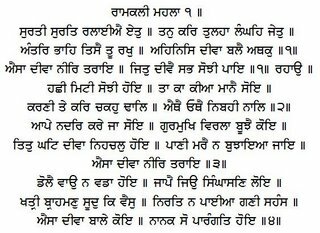 Now let us understand Guru Sahibji’s explanations and advices from one Shabad to another. Mix your conscious awareness with deeper consciousness (reference to deeper level of consciousness more universal in nature; keep in mind that all has originated from one source) in this way. Make a ropeway from physical body to cross over (starting point is physical body since our awareness is at physical level mostly). (Water is reference to all pervading presence of God; accept and feel this presence). The clay of the lamp gets better (means it is kept burning) when understanding is imbibed and accepted for action. When He Himself grants His Grace (when conditions are right), then, as Gurmukh, one understands how to burn the lamp. The wind (meaning maya’s attractions) does not shake one who has floated the lamp nor does he think himself bigger; even while feeling as if a throne has been found. Kh'shaatree, Brahmin, Soodra or even a Vaish (reference to all kinds of wordly people) cannot find the value of this lamp, even by thousands of calculations (which are material in nature). my sufferings (of physical realm) are put as oil in it. and I no longer have to meet the Messenger of Death ( means have understood there is no such thing as death ,the soul ever lives). The jewel is found within home of own self; when the lamp is lit.